Save or spend? What would you rather do would you rather save and retire or spend and continue accumulating stuff... hopefully the recession of 2008 has taught us that despite what the politicians tell us... it's every person for themselves. The more control you take over your finances, and realize that it is important to stop swapping years for money... the better off you are going to be, the more self-reliant you are going to be, which in turns makes you feel more in control of your own destiny... new flash, if you don't do it no one will. Great article in the July/August 2010 AARP mag, the Leap to Cheap, by Jeff Yeager...link below. Seems a recent Gallup poll showed that 62 % would rather save than spend up from 48 % in 2001. The question is will people still practice cheap living or will they go back to the old spending habits of 2008? Some folks that Jeff interviewed repeat the authors mantra that time is more important than money. Thanks for the reinforcement Jeff. The more stuff you accumulate, the less time you have to enjoy the stuff. You must earn more and more to maintain your stuff. Tis far better to have less and spend less...and more time to enjoy what you have. 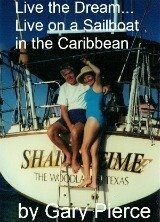 A "secret" the writer found out 18 years ago with the first year fulltime on the sailboat. Remember...the lifestyles of the rich and famous? Cheap living was not on Robin Leach's radar when this popular show started many years ago...perhaps it has contributed to the $16,000 in credit card debt the average American family has now. Consumption, not frugality has been the rule when we are in better economic times...your choice,save or spend. Save or spend? What is different now? The first baby boomers reached "normal" retirement age in 2012...they are living with the reality of the recession, poor stock market performance, low interest rates on savings, and out of control Government spending. My bet will be on continuing the frugal living habits forced upon many. Never have so many been slapped in the face with reality like the baby boomer generation...if the realization that spending less and taking more time to enjoy what you have isn't clear now...I would be very surprised.